I found this vanity that was pretty beat up at a flea market for $18. 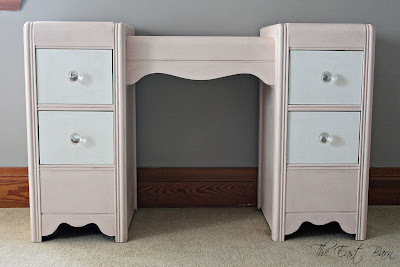 I knew I wanted to paint it pink so it could be used in a girls' bedroom. I painted this piece using a flat paint. The matte finish was fun to work with (similar to chalk paint). I really wanted the imperfections to stand out so I used a tinted wax to reveal them better. I even added more texture with brushmarks. 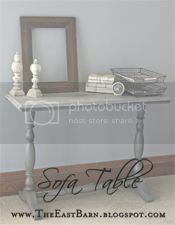 I tinted Annie Sloan clear wax with an oil based grey paint. It was a soft grey that didn't change the pink color as much, but was only held in by the texture that was there. This worked perfectly. I used the clear wax all over first and then waited 15 minutes before using the colored wax. I buffed the piece and it was finished. 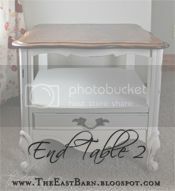 I love how it turned out and it was fun using the Annie Sloan waxing brush and wax I got for Christmas! I'm loving how the texture came alive with the grey wax! The knobs I got at Hobby Lobby added the perfect touch. 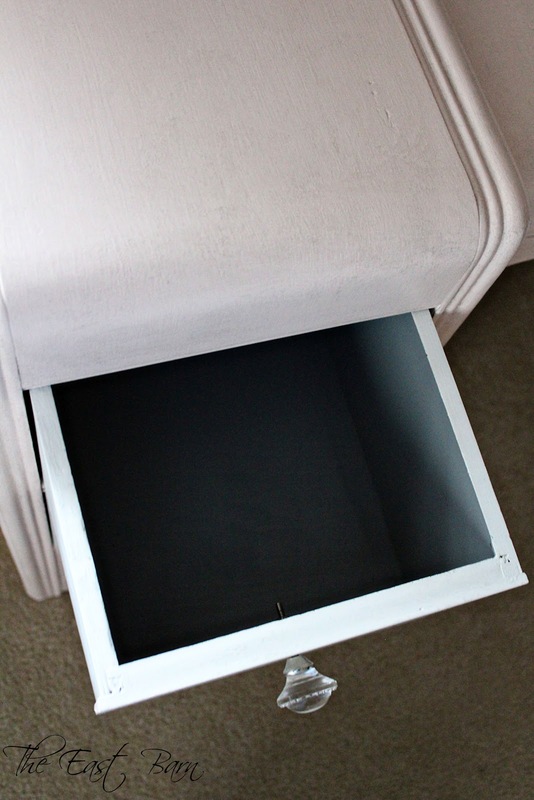 I painted the inside of the drawers grey to give that little something extra! I am selling this piece so hopefully it will find a good home soon! I love all the fabulous pics Kel! 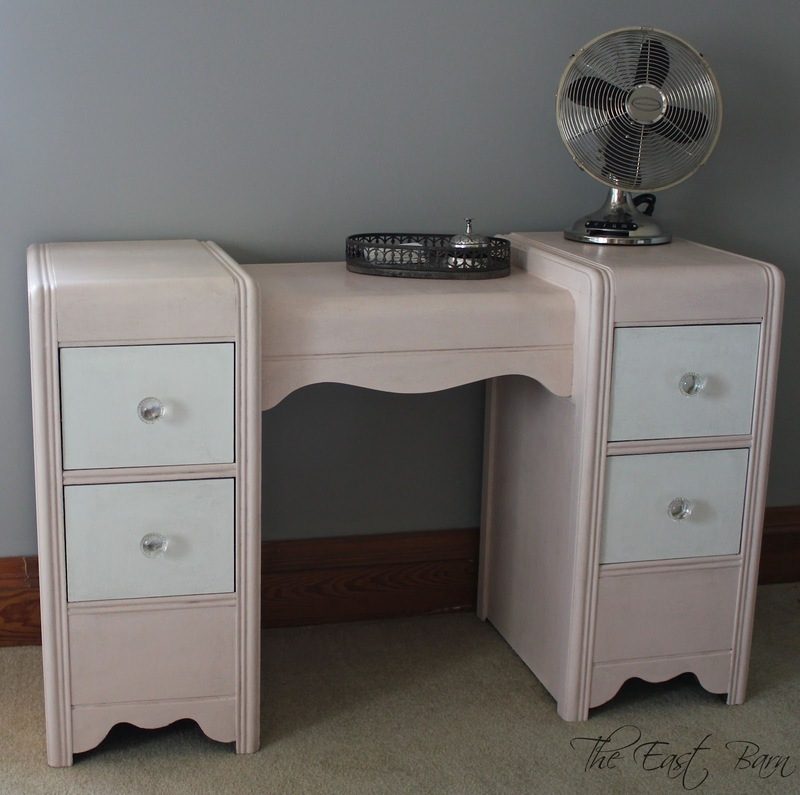 Great job on the vanity! Gorgeous! Love the knobs and the inside, I have a dresser just like this that needs a cute makeover like yours!Thank you for sharing this at simply creations link party! Thank you so much for your comment and hosting the party! Thank you Danielle! I have always wanted to do this color combination and I love how it turned out! ooohhhh I LOOOOVE this!!! Saw it over at Prim and Propers POWW faves features. I am your newest follower! Sooo cute and will be loved. It looks great in pink. Great job . 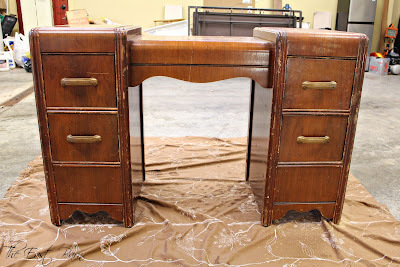 Great looking desk. Thanks for sharing with the newbie party. Please add my button too. Thanks. Actually vanity:) Either way it turned out cute and you can use it both ways. Sooooo pretty. Great combination of colors, and it DOES look so very feminine. Im new to blogland, only 2 weeks in, so COME VISIT ME. I've just become your latest follower. Please return the favor. Hello, my name is Kelly and welcome to my blog! I am excited to have a creative outlet through blogging! 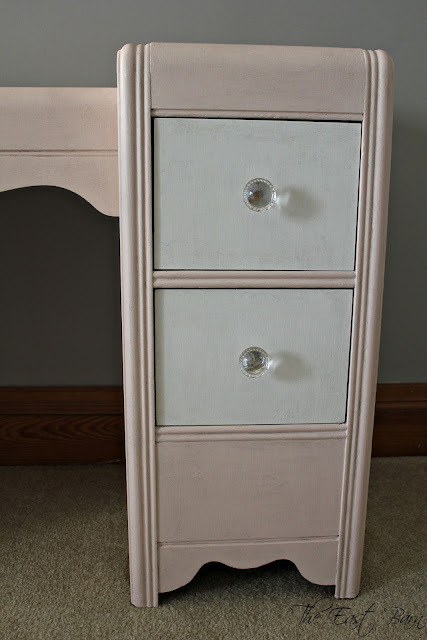 I just began restoring furniture and love what a little paint can do! My other passions include photography, scrapbooking, baking, quilting, thrift shopping, and design. I also work part time as a hairstylist. I look forward to sharing inspiration and new adventures. 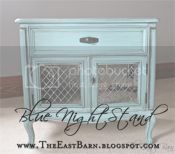 Thank you for stopping by The East Barn!